Success isn’t easy, especially when you’re trying to start a unique Euro show in a city that’s never had one before. 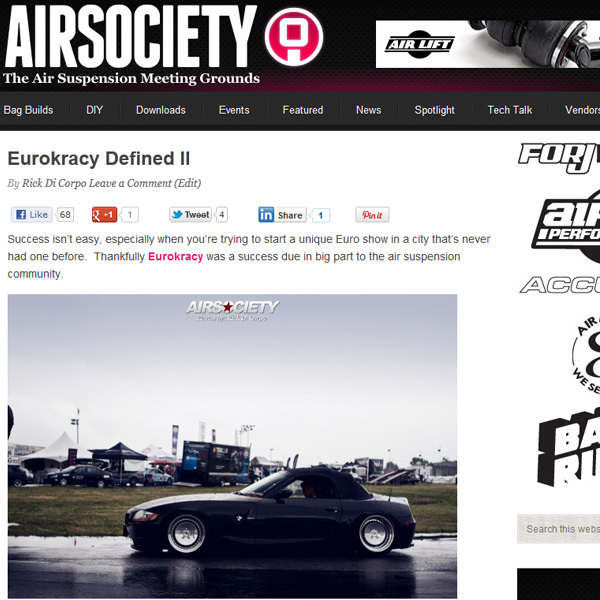 Thankfully Eurokracy was a success due in big part to the air suspension community. Taking home the Lowest Limbo prize at Eurokracy 2011, Manolo’s bagged BMW Z4 on 18″ Schmidt TH Lines is truly something that needs to be seen to be fully appreciated. Sitting just under 50″ from floor to the top of his windshield, this convertible beat out a VW Thing without out a roof and dropped windshield and a Rabbit Pickup stacked full with almost a dozen people to take home the gold. Unix Performance’s aired out Audi A8L sits low enough to almost be used as a dinner table, it even comes with dishes! Tucking a set of 19″ Work Eurolines and a custom fabricated bags setup, there’s no reason anyone should be afraid to dine with the guys from Unix.